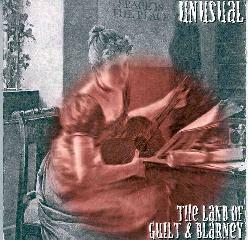 The Land Of Guilt & Blarney - "Cruel" / "Unusual"
The Land Of Guilt & Blarney is lead by the duo of Carl Howard and Louis Boone on all manner of synthesizers and effects. Both are also members of the heavy spacerockin' band Born to Go, both have played in the past with Alien Planetscapes, and Howard has released several recordings under the Nomusic moniker. The Guilty ones trademark sound consists of a steady pace... not too fast, not too slow, set by prominent electronic drums, and LOTS of varied synth sounds. Rarely is any one melody taking the lead. Boone and Howard excel at combining multiple layers of sounds and melodies into a cohesive whole. What's interesting is that all these layers are quite distinct from one another yet fit together cooperatively to produce something that is very freeform but clearly has a direction. The music is far too busy and varied to be classified as the floating type of electronica, though that is often an element of any given track. On Cruel, Boone and Howard are joined by several other musicians, among them Alien Planetscapes alumni Blaise Siwula on saxophones and L.G. Mair Jr on bass synth, Reginald Taylor on bass and synths, and Kenneth Brown on drums. A lot of people complain about electronic drums but in this case they seem integral to the bands' sound (though "Stealth Takes A Holiday" sounds like it's a track with Brown on real drums). Boone and Howard have no problem keeping things interesting when performing purely electronic tunes, but my favorite tracks on Cruel are the ones where Siwula's sax joins the fray. "Atomic Winds" is a cool combo of real sax and electronic ones and the music brings to mind a snake charming swami. "Immodesty Blaise" and "On Earth As It Is In Jersey" both feature great manic sax/electronica combos, particularly "Immodesty Blaise" on which the sax is just as freaky as the totally spaced out synth work, proving that the saxophone is indeed a true spacerock instrument! The rest of the tracks feature solid electronic driven tunes, often with a freeform jazz feel. "Aerobic Village" has a lot of sounds that remind me of Sun Ra, but isn't overtly jazzy. "Sprightly Mollusks" is freeform, but almost has a classical feel. Kind of like the soundtrack to a performance art piece. (Cool vibes sound too.) And "Urban Jezebel" is a solid spacey electronic piece with a jazzy edge, which could also function as a sci fi soundtrack. The music on Unusual, though similar to Cruel, is much darker in atmosphere, though no less adventurous. I really like the opening track, "Fair Play For Cuba", with its low deep bass and light percussion leading the music at a dark, plodding pace. The bassline is the leader, though all the expected varied synth work is present as well, plus intermittent efx'd voicings. One of my favorites is "Club Blyndo - Doomsday For Dummies", another dark atmospheric piece, this time with the digi-sax taking the lead for an electronic jam with a slow but steady drum beat. At nearly 10 minutes in length the music has plenty of room to stretch out and develop. Yet another tune that would make great freaky soundtrack. A longer track that doesn't work so well is "Somber Mollusks". If the Mollusks were Sprightly on Cruel, they are apparently Somber on Unusual, though the two tracks are similar. But this track, unlike most of the others, seems to plod on sticking to the same theme and not really justifying its 16 minute length. In contrast, "On Shifting Ground", doesn't change very radically either, but the shooting star synths and percussion set a groove while a parade of sounds, clangs, bangs, vibes, and you name it march through. The development is very subtle but I felt like I was lead on a purposeful direction. Another standout is "Scalin Mount Blount" which is more aggressive than any track on either disc. An intense tune that combines slow-paced potency with wild (and always varied) synth work. Having heard a number of projects from these musicians, and now three releases from this current project, I'm impressed with Boone and Howard's ability to be as space freaky as anyone can be, as well as incorporate the freeform aesthetic of jazz to produce some killer cosmic journeys. 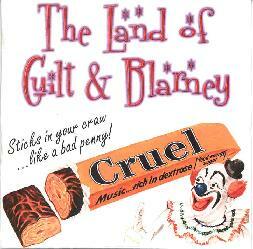 For more information you can email The Land Of Guilt & Blarney at litlgrey@ix.netcom.com.